Growing up there are just some things you "know", some rules that seem to be engrained into your very being. You don't really remember anyone every actually telling them to you but you certainly know that you have to follow and obey as the alternative is a much greater unknown. The look alone, when no words were even needed, was enough to make you want to crawl under the nearest piece of furniture and not come back out until a decade has passed. It was the generation that taught us these specific "life lessons" that shaped our character, molded our personalities and forever passed on the values and traditions that we would be remiss not to share with the coming generations. For me, my grandmothers, aunts, cousins and my mom were the women who shaped my personality....in more ways than one. My Gramma, Ruth Allen, was the grandmother who taught me how to make rolls from scratch, the most delicious pumpkin pie, and taught me the importance of getting back on the proverbial horse. I just love this picture! 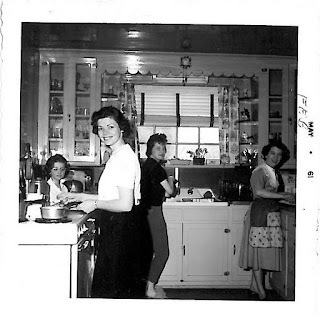 That is my grandmother, Ruth Allen, in the front. Isn't she beautiful! A long, long time ago, way back in 1998, I found myself stranded in the Salt Lake City airport for hours then stranded in the Atlanta airport for 10 more hours on my way home from Jackson Hole, all at the tender age of 14 with another 14 year old, Cathy Crafton, and a 12 year old, Scottie Gambill. My friends and I were done, we were spent, we could handle no more! After we finally arrived at BNA, which seemed a little like heaven at the time, my grandmother hugged this emotionally drained, physically exhausted child, only to have to take me to her house, let me rest, do my laundry and put me back on plane to Buffalo, NY to meet the rest of my family who was there for the 17-year-old World Series in which my brother was playing. I thought there was absolutely no way she was ever going to be able to convince this stubborn child, hell-bent on staying in the comfort of my grandparents home, eating my grandmother's incredible home-cooked meals, waiting patiently for my family to return, to get back on a plane, let alone to ever set foot in an airport again. There was no way she could do it, nothing she could say would convince me, nothing she could do would be enough to make me want to get in the car, head BACK to the airport and get on another plane, this time without ANYONE! I thought this the entire drive to the airport....alas, she won! It wasn't really a fight, I always did what she said, trusted her with more than my life and knew she wouldn't let anything happen to me. I knew this through the tears I shed as I walked through security, held close to my carry-on and listened as Gramma told me over and over again that she had arranged for someone to walk me from gate to gate at my layover in Pittsburgh....LAYOVER???? That's right, not only did I have to get on another plane but it wasn't actually the one that was going to take me to my parents, there was another plane I would have to find in a city I had never visited in an airport that was completely foreign to me. With all of this said, as my second plane landed in Buffalo, NY, I looked out the window and realized Gramma was right, I could do it, I had done it and never again, no matter my age, would I doubt myself, I would remember her encouraging words spoken to an unsure, insecure 14-year-old....nothing is impossible if you just have a little faith....and a pretty incredible grandmother didn't hurt either! Here is a little glipse into the women who shaped me into who I am today. This is only one of the many examples of how the women in my family have shaped my character and guided me down life's path. I think of my Gramma often when I am working on a new blog post and sometimes I still have the great fortune to have her with me while we cook. Sometimes I look over at her and realize that she taught me so much about everything from love, to family, to friendships and everything in between. Most of that came about while we were working in the kitchen though most of it had nothing to do with cooking. Some of it did though and some of it is pretty hysterical. For example, it was absolute sacrilege to do ANYTHING (and I mean anything) with my hair in the kitchen, the silver was always counted after it was washed and before it was put away just to make sure none had ended up in the trash (that actually did happen one Thanksgiving), and the main ingredient in my great grandmother's rolls was not flour or yeast, but according to my grandmother it was love. The more I thought about my family stories the more I began to remember some others I had heard like my sister-in-law Maggie's term "Kim-It". This term came about after family dinners her cousin, Kim, would be in charge of gathering up all of the unused silverware and returning them to their proper home. When there was a clean knife on the table after dinner one would simply "Kim-It". It wasn't until Maggie was well into her teens that she realized this was not an actual term in the English language, just a wonderful family-invented phrase! It is stories like that which I love! As I thought about all the "kitchen rules" I thought it would be fun to ask my friends and family and get some of their stories, memories and family rules. Ok so I am currently working on a blog post about all the rules I was taught growing up in the kitchen. For example, it was absolute sacrilege to do ANYTHING (and I mean anything) with my hair in the kitchen, the silver was always counted after it was washed and before it was put away just to make sure none had ended up in the trash (that actually did happen one Thanksgiving), and the main ingredient in my great grandmother's rolls was not flour or yeast, but according to my grandmother it was love. What I want to know is what are some of the rules you learned in the kitchen growing up? What were some of those funny things that you couldn't do or absolutely had to do should you ever find yourself on the glaring end of your elder somewhere in between the sink and the dishwasher. Sit back and enjoy, these are pretty great! Note: Dad was literally rushed to the hospital when he was a child with the mixer still stuck to his fingers....as I laugh about it now I am assured that my grandmother, Nannie, was NOT laughing then! Always clean as you go, we had an eat-in kitchen and no dining room so this was especially important. Dishes are done and put away directly after dinner, not DURING, or the next day. It was the only way we could all relax after a job well done...I still feel this way today. Cook cooks, kids/others clean, do dishes, and put away. Smell of the food cooking is what I still consider the smell of home! Amanda: I don't really have any rules, per se, but my mom did used to say that her one kitchen secret was that if my dad was on his way home and she didn't know what she was going to make for dinner yet she'd throw garlic and onions in the frying pan so that when he got home he'd say, "Smells great!" and my mom would say, "Dinner's almost ready!" Worked like a charm! Mary Beth: I didn't spend much time in the kitchen (obvi), but my mom always said: "Clean up your first mess before making another one!" Julie: I remember my father glaring at me once when I started to open a can without first wiping the lid. Mom then told me to wipe it off before opening it. Never forgot that. Of course, you know about Kimming the silverware! You never started cooking the bread and paska until December 23rd or the Eve of the Eve of Easter. If you spilled Salt ALWAYS and I MEAN ALWAYS ALWAYS ALWAYS throw it over your left shoulder. When you make the paska you aren't allowed to use the mixer. It's not how it's done and it will ruin the paska....you HAVE TO USE A FORK!! The paska won't work unless you us the flower pot as it's mold. We've been using the same flower for over 30 years. My dad purchased it the first year my parents married, or one of the first years. The bread will only rise if it's in the same two white tin bowls my dad bought at Shwabs in memphis 30 + years ago. One must use the same tea-towels to cover the bread while it's rising; otherwise, the bread will not rise. Sissy: When loading the dishwasher, always place the sharp objects down. Grandaddy has the scar to prove this theory. Always wash your hands after handling chicken or meat. Never drink out of the carton! Never serve the marinade juices unless thoroughly cooked. No snacking near the food prep area. When snacking, no double dipping! Don't leave the table until everyone is done. Don't begin eating until everyone is served. Don't leave the table without removing your dishes. Note: My Granddaddy was the only member of the family who liked dark meat on the turkey until his children married at which time he realized there was competition for the dark meat as all of his new in-laws were dark meat lovers as well. This is when the "no-snitching" rule was implemented, though not very effectively I must admit! Jessica: No standing or sitting on the counters (especially not to be able to reach the top shelf-aka the candy shelf), if you made the mess, you clean up the mess, no feeding the dog from the table, everyone clears their own plate. Reed: "the kitchen is closed" means "the kitchen is CLOSED"
Ellie: I can't think of any rules, but all my childhood kitchens had a stool. This somehow ended up being my spot, and I still get antsy if I can't find something high to perch on when other people are cooking in a kitchen. Really a chair just won't do! Susan D.:Don't mix the real silver with the flatware in the dishwasher because the stainless will tarnish the real silver. And don't put the real silver knives in the dishwasher because the knife part may fall off the handle since they aren't all one piece. Dyer: “Pasenca” (Pa-Sank-Cha) – Italian for patience was a big one, as in my grandmother would always tell my brother and I whenever we asked why something couldn’t be cooked faster or when something would be ready to eat. Maggie: Well, this isn't exciting...but wash your hands! Before you eat, before you cook, after you handle meats...etc. And of course, "Kim" any unused utensils after the meal! The hair thing, too! Although now that I have dog hair in everything, i guess I don't worry about as much! Hah! Another one I thought of is to keep your sink clear of dishes! I don't always do it, but I know if I do it makes everything better! There is nothing worse than waking up to a sink full of dirty dishes! Plus if you leave one in there, then they start mutltiplying! Jenny: I do remember my grandfather always fussing at us to keep all four chair legs on the floor. Sydni said my kitchen rule is no shoes on the counter and it is true! We have a big island in our kitchen and one half seems to be a catch-all as you come in the door and sometimes volleyball or ballet shoes end up on it! Drives me insane!! My grandmother on my Dad's side would flatten her homemade biscuits with her fingers so then it left finger indentions on the top of the biscuits after it cooked. We always said it was so we could quickly find her biscuits at family reunions. Now I do this to my homemade biscuits and maybe my girls will too!! Megan: This is so bad, but I can't think of one thing, Ruthie! I think my Dad's only rule was to have fun cooking, which I'm not sure that really applies to this post you're trying to do. He once forgot to buy the chicken for chicken enchiladas and all we had was hot dogs, so that's what we used in the enchiladas and we were cracking up while doing it. They turned out great that night but when I tried to re-create it with hot dogs years later it was disgusting- I think it was just the point of improvising that night and having fun with it. Marguerite: Don't fill the dog water bowl in the kitchen sink. Take it to the bathroom. Scottie: OK - this is sad but the one thing I remember is that no one could sit down to eat during the week until my Dad had had time to finish his cocktail after a long day at the office!!! Melissa: The best way to mix the dressing is with your hands, always sift all dry ingredients, and no jumping or slamming in the kitchen or surrounding areas while baking. Jana: Look in the oven before you turn it on in case someone has out something in there to marinate in plastic and keep the pets away...sorry dad! This is one of my favorites....Pam Koban (the mom) and Katie Koban (the daughter) debate their rules....priceless! 1. Family supper is every night, or at least 5 nights a week. Family supper is a dying practice and yet I would argue that there are few experiences more important in raising children. In fact, a few years ago a study was conducted of national merit scholars to find a common characteristic among them. There was one characteristic that was present in nearly all of them, while others were more scattered. That one characteristic? They had been raised having family supper together most nights each week. Now I don't know if it will improve your ACT score, but it is a chance to learn about each other, practice manners, try new foods, and even find out which fork to use and when. I think it's critical for family cohesion. 2. Always say grace before dinner. 3. Conversation 101: Everyone at our house had to bring 3 conversation topics to the dinner table, parents included. We went around the table and each person took his/her turn telling their topic. Everyone else was required to comment on it or ask questions. I know this sounds terribly contrived and borders on ridiculous. BUT before I instigated this dinner table practice, we spent a total of 10 minutes together eating a dinner that took me at least 45 minutes to prepare, the children spent most of that 10 minutes fighting and bickering at each other, and my husband would look across the table at me and silently mouth, "For this I came home from work?" Once everyone got on board with conversation 101, (and my husband was the hardest to get to do this) we all began to learn what was going on in each others' day, who was involved in what, what the heck does Dad do at work, etc. It was possibly the best idea I ever had. Supper time was so enjoyable. Everyone HATED this rule. Even my Dad. None of us wanted to talk. 4. No TV during dinner except on extraordinarily rare occasions. Dinner was family time. This Rule was terrible in the days before DVR. Imagine what would happen when 90210, Full House, or Seinfeld were having there SERIES Finale. NO ONE liked Mom very much. 5. No substitutions at the dinner table; too bad if you don't like brussels sprouts. We ate whatever was prepared. If I knew they didn't like it, I just didn't fix it so often. But everyone ate everything. The children learned to eat broccoli, asparagus, artichokes, seafoods, salads, fruit, casseroles, etc. To this day they eat lots of varied foods and are all 3 terrific cooks. This Rule also sucked. Especially; on Easter Sunday when Mom served Ham Loaf. (yes, I said Ham Loaf). 6. Children drink milk for dinner and lunch and any other time. No iced tea, no cokes, etc. And no "hall pass" just because you don't like it. Milk is good for you so drink your milk. I did, and still do, buy only whole milk. I don't care what the nutritionists say about the fat content; whole milk tastes better than 2% or skim. No one in the family had a weight problem, so we drank/drink whole milk. Except for Dad. ;) tee hee. We only drank Milk at dinner never at lunch. 7. We ate very little junk food like chips, pop tarts, etc. But there were always fresh home made desserts and cookies in the house. I think it's unrealistic to deny children sweets. Everybody likes dessert and cookies. Just teach them not to go overboard. They snacked on lots of fruit and some cookies. They had dessert every night after dinner if they wanted it. 8. WRT hair in the kitchen, this is so different from you, Ruth. I had 2 daughters' long hair to fix each morning before school. The breakfast table was the one place where they were sitting still long enough to get the job done. So I multitasked: while they ate, I fixed hair. In fact, the hair brush, ponytail holders, hair clips, and a humongous bag of hair ribbons was kept....IN THE PANTRY! hahahaha! We had Bows that were BIGGER than our faces. Larger than a Human head…imagine that. It was soooo uncool. Love this, Ruth! You made me cry and reminded me of all my dear memories with my grandmother and mother in the kitchen. I love thinking of my grandmother in her full length robe and her house shoes (which made the best clickaty-clack sound) in the kitchen. And the smells . . . oh, I miss her! PS-Wade reminded me of his family's tradition of "even-ing it out". When it comes to cakes, pies, and cobblers, it's always better if you go back and get a little more. You're just even-ing it out!